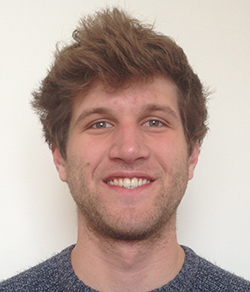 Junior Luke Strauskulage has been named as a 2014-15 Goldwater Scholar. Sophomore Samantha Usman was recognized with a Goldwater Honorable Mention. Goldwater Scholars are selected on the basis of academic merit from a field of mathematics, science and engineering students who were nominated by the faculties of colleges and universities nationwide. Virtually all have as their degree objective to obtain a Ph.D. The scholarships cover the cost of tuition, fees, books and room and board up to a maximum of $7,500 per year. The Goldwater Scholarship Program, facilitated by the Goldwater Foundation, honors Sen. Barry Goldwater (1909-1998), five-term Republican senator from Arizona (1953-65 and 1969-87) who was his party’s nominee in the 1964 presidential election. The Goldwater Scholarship, the premier undergraduate award of its type, was designed to foster and encourage outstanding students to pursue careers in the fields of mathematics, the natural sciences and engineering. Since its first award in 1989, the foundation has bestowed 7,163 scholarships worth approximately $46 million dollars. Strauskulage, of Mt. Cobb, Pa., is a biotechnology major in the College of Arts and Sciences with a minor in education studies and is in the Renée Crown University Honors Program. He plans to earn a Ph.D. in molecular biology, and coordinate biomolecular teaching and research at the university level. As a first-year student, Strauskulage worked as a research assistant in the laboratory of Jon Zubieta, Distinguished Professor of Chemistry, where he studied solid state coordination chemistry. He is currently working a research assistant in the lab of Ramesh Raina, associate professor and chair of the Department of Biology. There, he is studying the genetic and molecular mechanisms that regulate plant-pest interactions and the functional genomics of cell signaling in plants. He has presented preliminary data at internal university undergraduate research symposia and is planning to publish his work with small defense-associated proteins in Arabidopsis thaliana. At the University, Strauskulage is also a member of the Mock Trial team and the University’s Quidditch club sport team. Usman, of Pittsburgh, is a sophomore majoring in physics and mathematics in the College of Arts and Sciences and part of the Renée Crown University Honors Program. She plans to pursue a Ph.D. in astrophysics, leading to a faculty position at a research university, and conduct research in gravitational-wave astrophysics. At the end of her freshman year, Usman became involved with the Laser Interferometer Gravitational Wave Observatory (LIGO) and began working with Duncan Brown, associate professor of physics. Within the lab’s research Usman analyzed and helped to interpret data. She continued her work with LIGO this year as a research assistant and took an independent study course to learn more of the theoretical ideas behind gravitational waves. “This combination allows me to focus on two main aspects of the project: understanding the theoretical physics driving the experiment and the process by which observations work,” says Usman. “In the research portion of my work, I focus on data analysis and how to improve the algorithms being used. In my independent study class, I explore the physics behind the project. 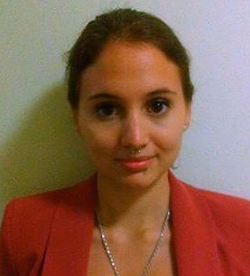 This combination allows me to improve my overall understanding of LIGO and help increase my contribution to the project’s scientific goals.” She is working on a paper for future publication. At the University, Usman is also a member of University 100, an International Young Scholars mentor and tutor, and a member of the Society of Physics. Students interested in the Goldwater Scholarship should contact the Center for Fellowship and Scholarship Advising at http://nationalscholarships.syr.edu/.